Another huuuuge musical feast coming your way this weekend - it must high season. Especially on the south coast where the live music scene in Sihanoukville, Kampot and Kep is on the up and up. Six gigs on the horizon for those in Sihanoukville this weekend. The great harmonica work of James Cecil hosts the regular Thursday night open-mics at Ritchies Bar this week and every week at this venue. Located right on the beach - a totally cool place to be on a Thursday evening. If you are a musician and you are in Sihanoukville then you should check the whereabouts of the Sihanoukville Music Collective - a band of disparate expat musicians playing a mix of pop, rock, blues, jazz, and funk apparently. This weekend they are playing are three different venues - The Kuren Bar, the newly opened Otres Market and Dara's Beachside Bar. Check it out. Metahouse continues to ramp up the DJ mix this weekend and it all starts tonight (Thursday) with a performance by VJ Schkouty, DJ Tonle Dub and Amplifire - featuring electronic mix artiste - Professor Kinski. On Friday the venue hosts a Fusion Party and on Saturday the Invisible Agent label brings you four DJ performers, Dr. Wah Wah, Warren Daly, Chris Bradbury and DJ Wez-T together with a visual show. Cool! As you may have heard, the world is about to end at midnight (presumably) on the 21st of this month (i.e. : Saturday - don't forget to put a reminder on your phone). There are several venues in party-mode for this so as to make sure that patrons can make sure they get their fair share of alcohol before this relatively tragic event. Equinox has astutely recognized that it is also the winter solstice and are celebrating both events, as well as Nick Kelly's birthday apparently. Pontoon have DJ Eclectik and DJ Ollieple playing, whilst La Croisette will host the Cambodian Space Project as celebration of the official soft re-opening of the venue. Super-cool! There are several other auspicious gigs on this same night. A new David Bowie Cover band will play at Sharkys this Friday. They are called Station to Station and JJ from the band writes: Taking the stage will be mixture of familiar and new faces on the local music scene - Jet Odrerir (vocals), Smokin' Kenny Smith (bass), Darren Jensen (Keyboards), Julien Mariani (drums), and JJ on guitar. The set list moves around the early to middle eras of Bowie's catalogue, so if you haven't heard "Let's dance" for a while, "put on your red shoes, and dance the blues" ! Or, help sing along to Fa- Fa-Fa-Fa-Fashion ! More info can be found on the band here: http://www.facebook.com/pages/Station-To-Station/453304414704700. Also on Friday night you can attend the launch of the new album by Gobeshite and DJ DSK at The Doors. Cool! If you somehow miraculously make it to Saturday then you will be able to be at the return of the totally house-pumping, eclectic reggae-dub band of Dub Addiction to Equinox. A totally great band. You will also be able to see the return of another band to Sharkys - the Lazy Drunks - this time sporting Scott Bywater on lead vocals as regular front man Ian Rowlett Anderson is currently with friends and family in England. The musical weekend doesn't stop there as there are gigs that occur on Sunday, Monday and Tuesday. These gigs in celebration of Christmas festivities. Coming up look for the elusive Krom as they make another appearance at The Doors. Also, if you are in Siem Reap, the look for a totally great acoustic performer called Mathius who will play at The Warehouse. Check out the following song from Mathius by CLICKING HERE. You can catch more of this performers music at http://www.reverbnation.com/mathiasmusic. Also (possibly) look for Finnish performer Bon Jouni who may be playing around the traps soon (more details here). The local music venues are offering an great variety of live music and DJ gigs across the country again this week - from House to Funk to classic rock and all the way to Yiddish Klezmer dance. Metahouse again have three gigs this weekend starting tonight (Thursday) with a mix of live drums from Greg Lavender (Durian, Up Two You Mango + more) and electronic mix artists DJ Flo Trallala and DJ Wez-T. Friday sees the venue traverse the cosmos of House music with DJ Dan Beck and DJ Moodydann and on Saturday night the exquisite, melodic saxophone of Stephane Routier will be joined with the funky spins of DJ Funkeslastiks. A cool set of DJ gigs. Sharkys celebrate their 17th Anniversary with a great set of gigs this Friday, Saturday and Sunday - all live sets. Friday sees the Kampot Playboys up from the south coast with their great renditions of Khmer 60s rock. On Friday the Curtis King Band returns to the land of wrong-way-drivers with, what will probably be, a night filled with total rock & roll entertainment. Curtis is certainly a guitar and harmonica player who is able to hit the special note combinations at the good times. The same can be said for Smokin' Kenny Smith who is one of the Kingdom's most outstanding exponents of classic Americana country-blues-rock guitar riffs. That is why the combination of Kenny, Curtis and Nikki Buzz and the boys from Play Like Jimi on the Sunday night jam at Sharkys should be something not to miss. There will probably be a long list of other local rock & rock exponents at this gig too - so I totally urge you to get down there and not miss this once-off classic combination. Play Like Jimi also play in Sihanoukville this weekend with two gigs at the Led Zephyr. Probably the biggest band yet to hit this venue so don't miss it. Other gigs of note this Friday include a good-wine, acoustic session by Scott Bywater at Rubies as well as the full-on danceable rhythms of Grass Snake Union at the Memphis Pub. Also you can go to see the new layout of La Croisette as Nancy Germany, SexPat Butcher and The Readers Wives make some big claims to radically shake-up the local music scene. Also see some thigh-slappin' rockabilly tunes by Two Shots & a Chaser at Paddy Rice this same night. Also on Saturday look for Durian as they follow-up there great return with a gig at the FCC Phnom Penh. News this week of the passing of one of the legends of alternative 60s pop rock - Ravi Shankar. In celebration of his music and in a continuation of last week's video theme, check out the following 12 minute track. Also check this totally outstanding video and totally well written and mixed production from The Beards & Julien Poulson. I can almost guarantee that you will be having this song in your head for the rest of the day after watching this video. Also check THIS great track from the a band playing around the local trap here - Auric Eyes. Another packed week of music coming our way as we cruise into December. Scott Bywater (aka Scoddy) will kick off the weekend and a month of Thursday gigs that he will host at the Riverhouse Bar & Bistro. Scoddy tell us to also watch this space for the return of the totally beautiful acoustic Khmer classics from Expresso Thmei - totally looking forward to that. DJ Afro also kicks off the weekend tonight (Thursday) in the first of a series of three DJ events at the Metahouse. Friday sees the Cambodian Space Project celebrating their 3rd anniversary at the FCC Phnom Penh. This is the first time the band has played at this venue and they will be joined by Chugge Khan. Chugge Khan is a total unique individual an amazing array of musical skills and a totally talented improvisational vocalist. This gig could be a totally great night and a not to be missed unique opportunity. A couple of weeks ago I featured one of his promotional videos (see here) which showcases his talent and connection to an amazing musical vibe. The video below shows his musical roots. Expect something very special when he teams up with the Khmer vocals of Srey Chanthy with the backing of the rest of the band. On the same night Sharkys present you with a great musical smörgåsbord with three bands - including the return of Squishy. Should be totally grungy, loud and danceable. If you are in Kampot then you have got to get to the Bodhi Villa on Friday as there is a great double bill with both the Kampot Playboys and Auric Eyes. Totally special. The huuuuuuge news on Saturday is the much anticipated return of total funk band Durian. The band is now featuring the gorgeous Rhiannon Johnson on funkadelic vocals. Expect a packed house and dance floor. 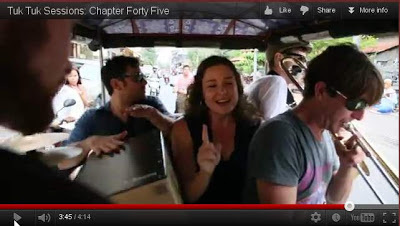 A taste of what to expect can be seen on Chapter 45 of the Tuk-Tuk Sessions web site. The video features the old line-up of the band but it will give you an idea of the total quality you can expect on Saturday night (remember this was all done live in one tuk-tuk). Also, two anniversaries on this week. On Sunday don't miss the new ensemble Jet and the Alley Cat Strays at the 7th anniversary of the opening of the Alley Cat Cafe. Next Wednesday catch Euan Grey and GTS Jazz as they help celebrate the 12th anniversary of the Riverhouse. Other gigs to look for are a series of gigs with DJ Martic Dinsdale in Siem Reap where he teams up with the sax players on a couple of occasions. Also, Balgass, early on Friday at Le Jardin as well as gigs at two new music venues - the K'nyay Bar and The Blitz. Also in Siem Reap you can catch the continuation of the tour of Cambodia by Play Like Jimi - the Jimi Hendrix Tribute band. The totally great guitar work and a great set of songs can be heard at Paddy Rice on Friday with Sugar Daddy. News in also that a moviecalled Bangkok Jam has been selected for the 3rd edition of the Cambodia International Film Festival. The movie will be screened for free at the Platinum Cineplex (5th floor of the Soirya Shopping mall) on Monday, December 10th at 5pm. The film features French punk legend Didier Wampas the lead male role and the female Cambodian bass player Nalen plays the lead actress. The shooting of new scenes for a sequel is planned on the same night at the Sharkys. The film festival will be opened by music from the Cambodian Space Project at the Legend Cinema on the third floor of City Mall (next to the Olympic Statium on Monireth Blvd) on this Friday at 4:00PM. They will play a fifteen minute rendition of an original soundtrack to the classic Une Voyage Dans La Lune. Cool! I will leave you this week with another Rajasthani style video. Get into it!